Check this: Classic clip alert! Zombie vs shark! 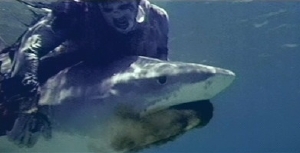 After reading the recent news that George Romero's next horror outing will involve underwater zombies, I couldn't resist but reminisce on the single greatest (and weirdest) clip from a zombie film I can think of - which is, of course, Zombie vs. Shark from Lucio Fulci's seminal undead film Zombi 2. Since the scenario is, ironically enough, both inexplicable and self explanatory, I'll just let you watch it for yourself after the break. God I love the Italians!